The first trailer and poster for Spider-Man: Far From Home has arrived and finds our friendly neighborhood superhero taking the action over to Europe. As you can see, the villains in the film will be Elementals and we also get a look at Jake Gyllenhaal as Mysterio. While Mysterio looks to be helping Spider-Man take on the villains, there’s a good chance that he’ll turn out to be the real villain in the film as Mysterio is a classic Spidey villain. We also see Samuel L. Jackson’s Nick Fury co-star as he recruits Spider-Man to help save the day. This looks to be an absolute blast and I cannot wait to see it. Far From Home was and continues to be one of my Most Anticipated Movies of 2019 and looks to continue to ride the Spidey high from Spiderverse. 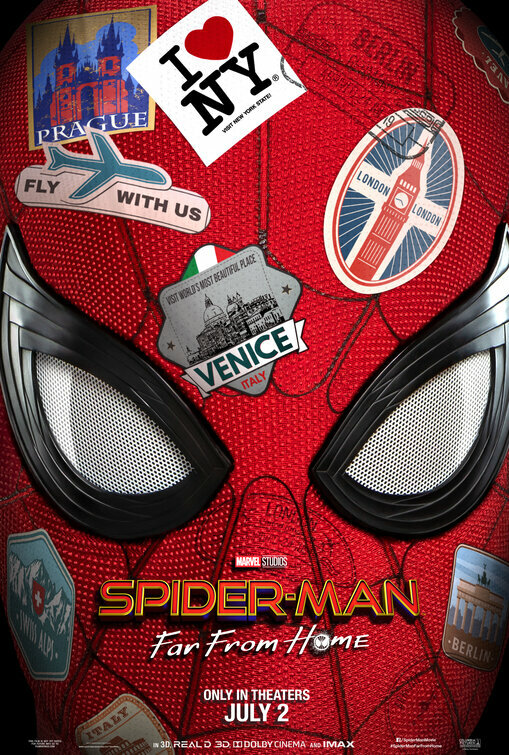 Spider-Man: Far From Home stars Tom Holland, Samuel l. Jackson, Marisa Tomei, Jon Favreau, and Jake Gyllenhaal and is scheduled to open in theaters July 5. Tags: comic book movies, Jake Gyllenhaal, Marvel, Marvel movies, movie poster, movie trailer, posters, Samuel L. Jackson, Spider-Man, Spiderman, summer 2019 movies, summer movies, superhero movies, superheros, tom holland, trailers. Bookmark the permalink.